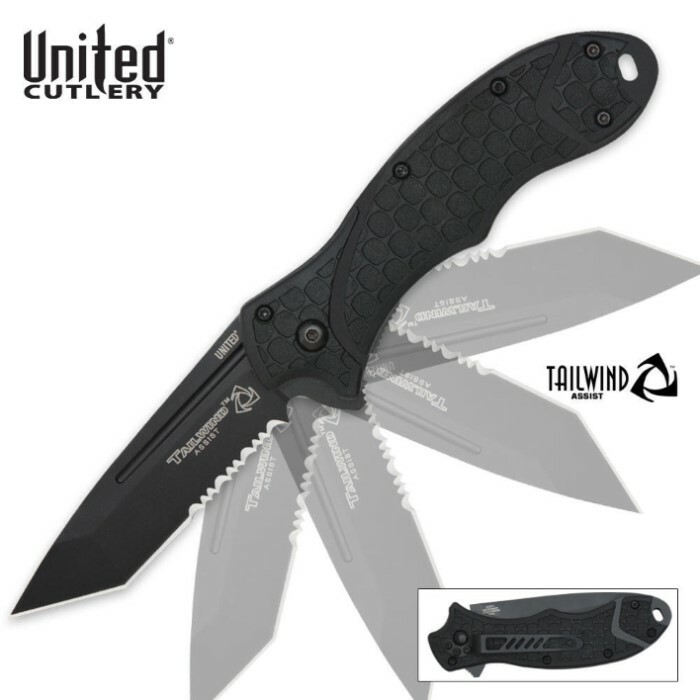 United Cutlery Tailwind Assisted Opening Atomic Steel Pocket Knife Black | BUDK.com - Knives & Swords At The Lowest Prices! Bought this knife as a gift but I might have to keep It. perfect size for every day carry. Love it. This knife is what it says it is. Opens super fast and a super sharp blade. This is now my favorite knife. This is a another must have knife. This tailwind lives up to the claim fastest assisted open knives on the market. It snaps open with such force, it puts other assisted open knives to shame. Fits great in the hand, came with a good edge easily made razor sharp, and the serrated portion of the knife...just plain nasty. I really like the tanto style blade it adds to the toughness of the knife. Great self defense item to have, solid built knife. I liked it so much that I ordered another, you cant go wrong with this tailwind. If you're looking for a great everyday carry knife then buy this knife.